Tea has long been touted as a beneficial health beverage, with many flavors such as cranberry tea being introduced to stimulate the taste buds of the drinker. Combining tea with the healthy and delicious aspects of cranberry was destined to become a favorite of tea lovers. Cranberries are evergreen bushes that grow in wetland areas called bogs. The shrub itself is low to the ground, often sending out trailing branches to give them a creeping appearance. Green foliage composed of tiny leaves cover the thin branches, with dark pink flowers appearing in the spring season. These flowers develop into a fruit that, although called a berry, is not a true berry. Instead, the cranberry is considered to be a “false” berry; meaning that the fruit forms below the flower. Other examples of false berries are blueberries, cucumbers, watermelon, squash, pumpkin and bananas. When the cranberry fruit first forms on the plant, it is a hard, white sphere. As the fruit ripens, it darkens in color; becoming a scarlet red when fully ripe. 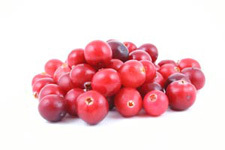 An edible fruit, the cranberry exhibits a strong tart flavor although it contains sugar content. The fruit of the cranberry bush is considered to be a very healthy food source. They are packed with Vitamin C, fiber and antioxidants that make them very valuable to the diet indeed. In fact, in the 17th century, documents record that cranberries were used in a medicinal purpose to treat stomach upsets, problems with the liver and the blood. Sailors consumed the small fruit to battle bouts of scurvy that were prevalent on board ships. The fruit’s value to the human health has long been revered, and continues to be recommended by doctors and nutritionists alike for a variety of ailments. *Cancer, stroke and heart disease may be able to treated, at least in part, due to the high levels of antioxidants in cranberry tea. Knowing and understanding the great health benefits of teas made with cranberries should encourage people to drink more of the delicious and refreshing beverage. One of the great ways to be sure to get enough of the cranberry’s healthy benefits is to drink cranberry tea. Tea in itself provides a great health benefit, and combining the delicious beverage with the antioxidant properties of cranberries make it an even more powerful beverage. Tea bags that have been specially blended with green or black oolong teas and dried cranberries can be purchased, but can often be an expensive investment. It is easy to make cranberry tea in your own home, and a couple of delicious recipes are all that are needed. Combine the water and cranberries in a large pan; bring to a boil and then reduce heat. Simmer uncovered for 30 minutes. Remove from heat. Add remaining ingredients; cover and allow to steep for one hour. Strain and enjoy.